We'd long heard that Libyan leader Moammar Gadhafi admired former U.S. Secretary of State Condoleezza Rice. In 2007, he called her "Leeza ... my darling black African woman" whom he loved "very much." Just words? Perhaps. Or maybe, as a discovery this week suggests, he really was quite impressed. Rebels ransacking his Bab al-Aziziya compound in Tripoli found a photo album of Rice, The New York Times reports. "There she is, in one (picture), smiling off to the side, her flip-do accented perfectly for the camera. And there she is in another, smiling next to you-know-who during that visit to Tripoli. He is wearing a flowing white robe with purple sash and Africa pin; she looks more businesslike in a gray pinstripe suit with white pearls, her flip-do having given way to a page-boy bob." The site of the 30-foot granite sculpture opened to the public Monday. [Updated at 9:15 p.m. 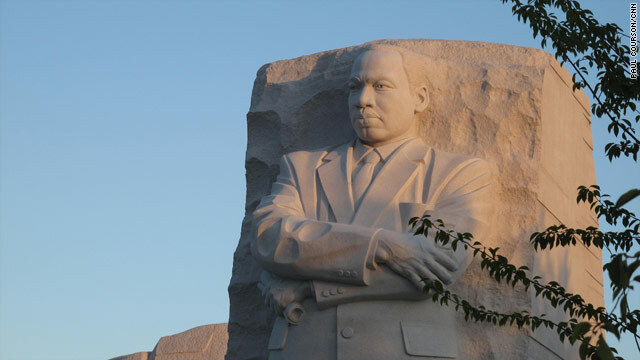 ET] Sunday's dedication of the Martin Luther King Jr. National Memorial in Washington has been postponed because of Hurricane Irene's expected advance on the U.S. East Coast, an organizer said Thursday evening. Harry Johnson Sr., head of the memorial's foundation, said that the last event of a series that had been planned for the weekend would be a national prayer service on Saturday. The dedication of the memorial will be moved to a still undetermined date in September or October, he said. Johnson and other organizers had said five hours earlier that the dedication would go forward as scheduled. But Thursday evening, Johnson told reporters that foundation officials changed their mind, deciding to postpone the event out of concern for visitors’ safety, after consulting with officials and forecasters tracking the storm. "The obvious reason why we’re making this announcement is to allow those folks who have not yet travelled here the opportunity not to come in harm's way," Johnson said. "We're also offering up the opportunity for those who are here, that if they want to try to leave, they can leave before the weather gets bad on Saturday." 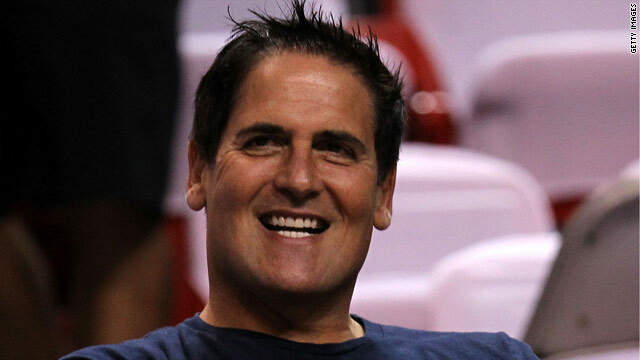 Mark Cuban, owner of the NBA's Dallas Mavericks, plays it cool when it comes to defending his college football plan. Who's in favor of college football BracketBusters? That would be Dallas Mavericks owner Mark Cuban, who made the proposal to the NCAA this month. The plan essentially would allow the top four teams in the BCS standings from conferences without championship games (and from among independents) to play an additional game in December. Steve Jobs is stepping down as Apple's CEO. 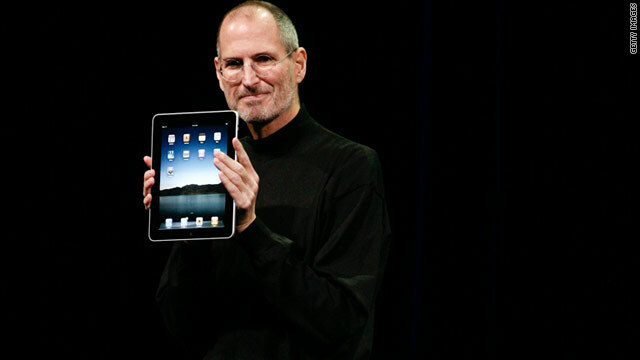 After a lifetime as a technology wizard, Steve Jobs is stepping down as CEO at Apple. His path was not a steady climb to the top. Rather, he dropped out of college after one semester and quit a job to backpack through India, before starting Apple Computer in his parents' garage with partner Steve Wozniak. Many CNN.com readers had wonderful things to say about Jobs and his products. Almost as many did not. CaptainFSU said, "From dropout to visionary to cult leader..."
[Updated at 5:32 p.m. ET] A hurricane warning has been issued for coastal North Carolina from Little River Inlet north to the Virginia border, including the Pamlico, Albemarle and Currituck sounds, the National Hurricane Center said in its 5 p.m. ET advisory. The warning is for Hurricane Irene, which on Thursday was pounding the Bahamas as a Category 3 storm. A hurricane watch also has been issued for the U.S. East Coast from the Virginia-North Carolina border northward to Sandy Hook, New Jersey, including Delaware Bay and the Chesapeake Bay south of Smith Point, the hurricane center said. Five governors - those of New York, Virginia, New Jersey, Maryland and North Carolina - have declared a state of emergency for at least parts of their states. The emergency declarations allow states to free funds and prepare resources that may be needed. 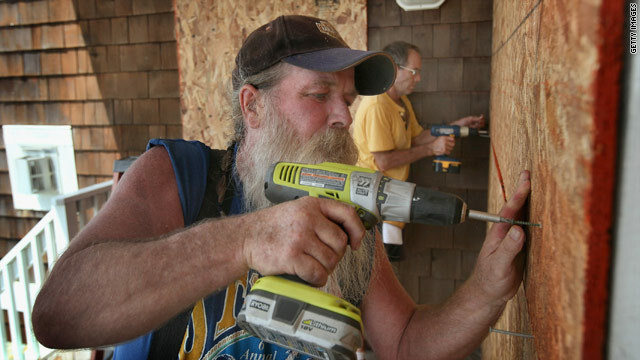 Andy Sullivan, left, and J.C. Baker board up a home Thursday on Nags Head along North Carolina's Outer Banks. No evacuations have been ordered as the storm path appears to be too far east to present serious problems. However, state emergency officials are monitoring Irene and have contingency plans in place. The state emergency management agency is using its website, Twitter, Facebook and YouTube to keep the public informed. Gov. Bev Perdue declared a state of emergency for counties east of Interstate 95. "Hurricane Irene poses a significant threat to our state," Perdue said, "and we need to take appropriate action to ensure the safety of our residents and visitors, along with property and infrastructure along our coast." The latest hurricane center advisory projects Irene will make landfall late Saturday afternoon near Ocracoke. Tropical storm-force winds and rain are projected to begin late Friday and could increase to hurricane-force winds later Saturday. Evacuations began Wednesday for visitors to Ocracoke Island. Beginning Thursday morning, residents of all of Hyde County and visitors to Dare County are being evacuated. Residents and visitors to Carteret County were ordered out Thursday afternoon. For updates about the storm, follow North Carolina Emergency Management on Twitter, Facebook and on the Crime Control and Public Safety website. The Hampton Roads region of Virginia is at greatest risk from Irene, the state's Department of Emergency Management says. Winds could reach 95 mph in that area, and flooding is possible throughout the eastern end of the state, the agency said. "Irene's path is not certain, and a small change in the track could bring different impacts," said Michael Cline, state coordinator for the Virginia Department of Emergency Management. "Virginia state agencies are getting ready for the storm, and so should residents." No evacuations have been ordered, but flooding could prompt localized evacuations. Residents are advised to pay attention to local media for announcements from their municipalities. The U.S. Navy is sending three submarines and 27 ships based in Norfolk, including an aircraft carrier, out to sea to ride out Irene, a senior Navy official told CNN. An additional 28 ships will seek more sheltered areas. The district was offering no specific hurricane guidance on its website, Twitter or Facebook page. Emergency officials were more concerned with the aftermath of Tuesday's minor earthquake than preparing for Irene. Mayor Vincent C. Gray said on Twitter that there were no plans to reschedule or move Sunday's dedication of the Rev. Martin Luther King Jr. Memorial. Gov. Martin O'Malley declared a state of emergency Thursday afternoon in advance of the storm's anticipated weekend arrival. The Maryland Emergency Management Agency was providing links to the Federal Emergency Management Agency and the National Oceanic and Atmospheric Administration. The agency's website has a link to an interactive map to help residents identify flood-prone areas. "Have a plan, get a kit and stay informed," Delaware Emergency Management Agency Director Jamie Turner said. "We want everyone to have food and water for at least three days, batteries for lights and radios and a means of charging cell phones. "Remember that part of your emergency plan is to have a destination in mind if you have to evacuate. If officials instruct you to evacuate, please do it." The eastern part of the state was experiencing heavy rain Thursday and some localized flooding from thunderstorms not associated with the hurricane. Rainfall from Irene - expected to be as much as 7 inches in the Philadelphia area - could cause the Schuylkill River and other bodies of water to flood. Tidal flooding along the Delaware River is also possible. "It is strongly recommended that Philadelphians living in flood-prone areas make alternative arrangements to stay with family or friends whose homes are not prone to flooding for the course of this event and until the flooding threat subsides," Philadelphia Mayor Michael Nutter's office said. The state's Emergency Management Agency website has a module to subscribe to text or e-mail alerts. Gov. Chris Christie has declared a state of emergency. In an afternoon news conference, he also urged people to leave New Jersey Shore points before the hurricane arrives. If the hurricane continues on its current track, then "from a flooding perspective, this could be a hundred-year event," Christie said Thursday. The state's emergency preparedness website warned of the danger of a hurricane storm surge: "The storm surge is a dome of ocean water the hurricane pushes ahead of itself. At its peak a storm surge can be 25 feet high and 50-100 miles wide. The storm surge can devastate coastal communities as it sweeps ashore." Irene's current track could make it the most destructive hurricane to strike New York City since 1938. New York City Mayor Michael Bloomberg suggested people on Long Island and living along the East and Hudson rivers take precautions such as moving furniture and valuables to upper floors, and urged them to refrain from swimming in the high surf the storm is likely to stir up. City crews were hurrying to clean out storm drains and catch basins to minimize street flooding, Bloomberg said at a news conference. Officials will consider evacuating low-lying places such as Coney Island and Manhattan Beach in Brooklyn; Far Rockaway and Broad Channel in Queens; South Beach, Midland Beach and other low-lying areas on Staten Island; and Battery Park City in Manhattan, Bloomberg said. "We don't have enough information yet to make that call. There are still too many unknowns, but we will make a decision on whether to call for evacuating certain areas based on the track, the speed, and the strength of the storm as it moves from the Bahamas up the East Coast," he said. 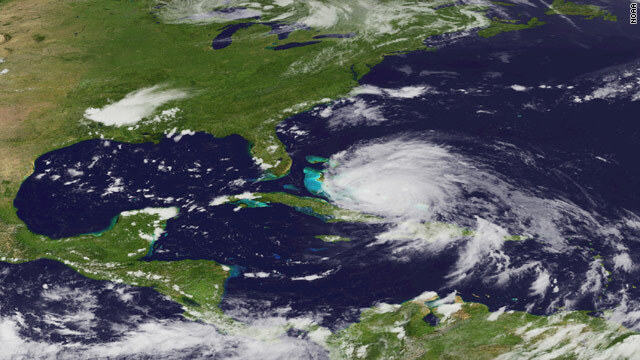 Irene is forecast to arrive in Stamford around 5 p.m. Sunday as a Category 1 hurricane, according to Gov. Dannel P. Malloy's office. Malloy intended to outline the state's response plans at a Thursday afternoon news conference. The Massachusetts Emergency Management Agency website features numerous articles on hurricane preparation and safety, including how to keep pets safe. It gives instructions for following evacuation orders should that become necessary. There is also a Cape Cod emergency traffic plan. Rhode Island's Emergency Management Agency on Thursday urged residents to put together emergency kits to tide them over for up to three days. There were no immediate plans for evacuations. Officials were monitoring the storm's progress but had issued no guidance by Thursday afternoon. New Hampshire's population has surged since the Great New England Hurricane of 1938 killed 13 people and caused $22 million (in 1938 dollars) in damage, the state's readiness site says. "A repeat of this event today would be devastating," it says. "The state's population has more than doubled since 1938 and much of that population growth has been in areas near the coast or inland waterways. There are many more people in harm's way today." The New Hampshire Division of Homeland Security and Emergency Management and the American Red Cross in New Hampshire have posted recommendations for hurricane preparations. "Be prepared, and 'stay tuned,'" Maine Emergency Management Agency Director Rob McAleer said on the agency website. "Irene could bring heavy rains, high winds, storm surge or any combination of those things. Pay close attention to weather forecasts, and start now to think about your personal emergency plans. You want to give yourself enough time to take care of your home, business or boat before the storm arrives." No official warnings had been issued. Casey Anthony has started a one-year probation sentence for check fraud and fraudulent use of a personal ID, the Florida Department of Corrections announced Thursday. She held her first probation meeting Wednesday evening, according to the department. Officials refused to say where in Florida Anthony is serving her probation, noting in a statement that they have been directed by local courts to "keep confidential (Anthony's) residence or any information that could lead to the discovery of her location because of the death threats against her." Libyan leader Moammar Gadhafi, seen here in November, is surrounded at an apartment complex in Tripoli, rebels say. [Updated at 4:54 p.m.] An agreement has been reached in the U.N. Security Council to release $1.5 billion in frozen Libyan assets to the country's fledgling rebel government, diplomats said Thursday. [Updated at 2:13 p.m.] Gadhafi loyalists have destroyed an empty Libyan airline passenger plane parked at the international airport in Tripoli. 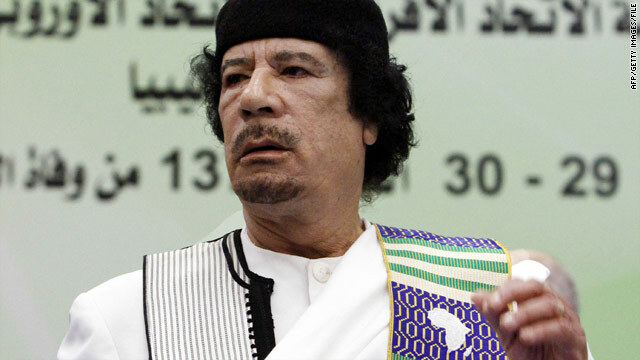 [Updated at 11:54 a.m.] A message purportedly from Moammar Gadhafi was aired Thursday on a loyalist radio station. The speaker urged people not to leave Tripoli "for the rats." It further implored listeners to "Go out into the streets and fight." CNN cannot independently confirm the authenticity of the recording. Gadhafi has previously described his adversaries before as rats. [Updated at 10:49 a.m.] The main source of the opposition's supplies is coming from fighters loyal to Gadhafi. As the rebels win battles, they gather up the enemy's weaponry and equipment to add to their own arsenal. In Ras Lanuf, home to an oil refinery capable of producing hundreds of thousands of barrels of oil a day, a long line of trucks awaited refueling. Most of the trucks had been taken from Moammar Gadhafi's loyalists and been retrofitted with heavy weaponry, including anti-aircraft guns and a rocket launcher. Ras Lanuf is about 125 miles from Sirte, Gadhafi's hometown and one of the Libyan leader's last strongholds. Gadhafi has a $1.4 million bounty on his head, but despite claims that he is holed up in an apartment complex in Tripoli, observers are skeptical because of a past rebel assertion that they knew where the Libyan leader was hiding and another announcement that they had captured his son, Saif al-Islam. Neither were accurate. [Updated at 10:15 a.m.] There has been sporadic but intense artillery fire throughout day near Tripoli International Airport as rebels try to capture the highway connecting the airport and the capital. The airport is about 17 miles south of the capital. An 80-year old Austrian man is being investigated for allegedly sexually abusing his wife and his two mentally disabled daughters for more than 40 years, police and a prosecutor said Thursday. The man's wife died three years ago, investigators said, but the daughters still lived with their father in the northwestern town of Braunau. "He isolated the two women from the outside world for all the time," said Ernestine Heger, one of the prosecutors in the case. North Korean leader Kim Jong Il arrived in China Thursday after a visit to Russia, the state-run Xinhua news agency in China reported. The brief report from Inner Mongolia said Kim was visiting northeastern China but gave no further details about what he was doing or who he was meeting. The trips comes after Kim visited Russia earlier this week, where he said North Korea is ready to return to nuclear talks without preconditions, according to Russian President Dmitry Medvedev's spokeswoman. Medvedev and Kim talked for about two hours, Medvedev's spokeswoman Natalia Timakova told Russia's Interfax news agency. British Home Secretary Theresa May will sit down with officials from the social media industry Thursday, her office said, as the government considers trying to ban people from social networking during or after crises. Twitter, Facebook, and BlackBerry maker Research in Motion all declined to say what position they would take at the meeting. Top police officers and other government officials will also be present for the meeting, which follows riots that swept England earlier this month. Prime Minister David Cameron suggested limits on social networking in the wake of the unrest. Diplomats from 29 countries are attending a meeting of the Libyan Contact Group, a coalition of Arab and European governments as well as the United States and Turkey, in Istanbul. Representatives from NATO, the African Union, United Nations, European Union, Arab League, Gulf Cooperation Council and Libya's National Transitional Council - the rebel Libyan government - are also present. The meeting began Thursday with opening remarks from Turkish Foreign Minister Ahmet Davutoglu. Turkey is one of the co-chairs of the Libya Contact Group. Hurricane Irene continues its path toward the United States. Watch CNN.com Live for continuing coverage of the storm. 9:00 am ET - NYC briefing on Hurricane Irene - New York City Mayor Michael Bloomberg and others discuss how the city is preparing for Hurricane Irene. A NOAA satellite image shows Hurricane Irene in the Caribbean Sea. Officials in a stretch of coastal North Carolina ordered all visitors to evacuate ahead of Hurricane Irene, which damaged homes in the Bahamas on Wednesday as it churned toward the U.S. East Coast. Irene, with maximum sustained winds of 115 mph, could jump to Category 4 strength on Thursday, the National Hurricane Center said. Federal emergency management officials had a simple message for those in or near the path: Be prepared. The future of Libya remained in question Thursday even as rebels moved to solidify their hold on power, while fighters battled forces loyal to Moammar Gadhafi and the hunt intensified for the embattled leader. Elsewhere, Italian Prime Minister Silvio Berlusconi was to meet in Milan with the interim prime minister, Mahmoud Jibril of the National Transitional Council, and the Libya Contact Group was to meet in Istanbul. The tech world is reeling from Wednesday evening's news that iconic innovator Steve Jobs has resigned as CEO of Apple Inc.
What has Jobs meant for Apple, for technology and for the economy? And who is Tim Cook, the executive who is taking over for him? The Labor Department's weekly jobless claims figures will be out at 8:30 a.m. ET. Investors are looking for unemployment claims to fall by 8,000, to 400,000 claims. President Obama is honing his jobs plan while vacationing on Martha's Vineyard, Massachusetts. The African Union holds a summit meeting in Addis Ababa, Ethiopia, to pledge help for the victims of the drought in the Horn of Africa. According to the United Nations, some 640,000 children are threatened with acute malnutrition. The U.N. is seeking private and government donors.